like how to see them in their time. bending people with blunt faces and harsh clothes. 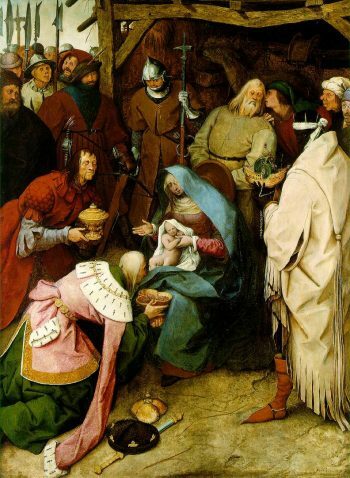 Bruegel’s Adoration does not adore the child nor worship the mother. in their movements, dancing, falling, adoring, running. Terminally alone together, this world a floating sea of particularities. Mary talks silent with a wide hand. Older Joseph listens behind her blue plainness. Sweet Jesus throbs wild, ratcheting in his reaching. Many look one-eyed at what’s so hard to see. Close up, faces blur smeared in their bones. steady with that mystical gift. in a corner where outsiders are left to be. is not a painting to look past at. It is a painting to consume, for your eyes to eat. This Copernican revolution of the solitary mind gnawing at its people. Ed ‒ The painting is in the possession of The National Gallery, London.